Asparagus Side Effects - Bloating, Gas and Urine Odor! We don’t often think of foods, particularly good and healthy foods, as being capable of producing side effects. Sure there are the common reactions to those bad-decision hot wings or an over indulgence of high fiber content foods that everyone encounters once in awhile, however some foods, like asparagus can produce side effects when eaten or taken as asparagus tea or even when used in herbal forms such as asparagus extract. If there is one commonly known result of gobbling this green vegetable, it’s urine odor. If you’ve ever been in a public stall next to someone who has had a little too much asparagus, it’s often very, very obvious. A pungent odor can quickly develop as a result of this healthy side dish. The bathroom troubles don’t quite end there with regards asparagus side effects. In fact, many of the conditions associated with asparagus side effects occur below the waistline. Tummy troubles such as excessive gas and bloating have been reported in many asparagus lovers meaning that you can be a nasal hazard to all around you in a public restroom. Bloating and gas frequently can lead to abdominal discomfort which can exacerbate uncomfortable sensations. 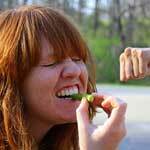 However, all of the asparagus side effects in the world shouldn’t deter you from munching on this tasty treat. Asparagus benefits include large doses of healthy vitamins and minerals essential to many body processes. Vitamins B6, C, and E along with loads of beneficial minerals can all be yours simply by incorporating this often ignored vegetable into your diet. Perhaps the positive asparagus side effects will outweigh a self conscious trip to the bathroom. There are a few rare cases where asparagus should be omitted from your diet or natural healing plan. Pregnant women, whose hormones can be affected by asparagus, should not partake; nor should people using lithium, a medication that can be affected by the diuretic effects of asparagus. If you are concerned about medication or health condition interactions, consult your health care provider before enjoying. Lastly, if you’re allergic to onions, leeks or chives, feast with caution because people who are sensitive or have allergies to these foods may also experience the same effects with asparagus.